Here you can find the latest filter curves used by the CSP. These have been derived by scans performed by a group from Texas A&M including Jean-Philippe Rheault, Jennifer Marshall, Darren Depoy, and Steven Villanueva. They measured the relative throughput of the telescope and SiTE #3 CCD using a monochromator based light source with a 2.5nm bandwidth FWHM for each of the filters: B, V, u, g, r, i and no filter. They also performed the same measures on the IR camera Retrocam with the J, H and Y filters, which are now complete and shown below. The K-band scan is still a work in progress. The latest data release includes a discussion on the zero-points and can be found here. Discussion of the NIR filters will be presented in an upcoming paper. 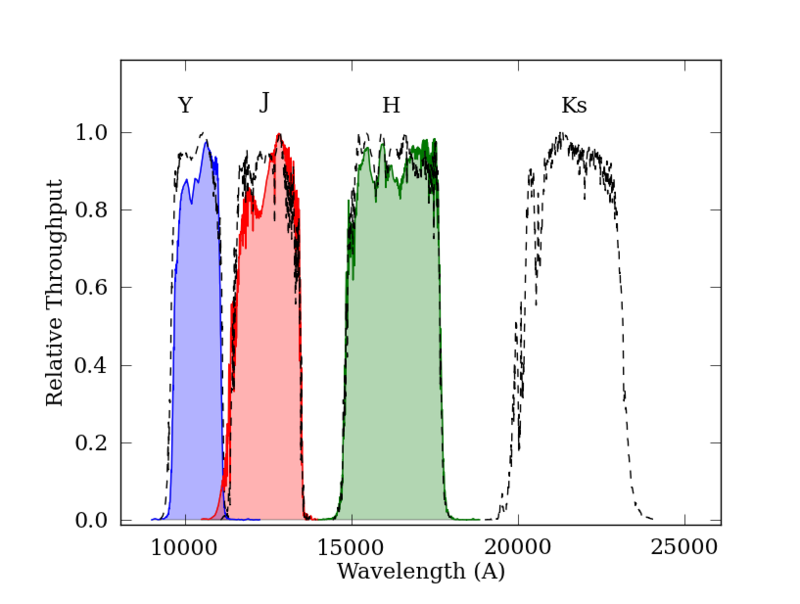 Above figures show the relative shapes of the filters. 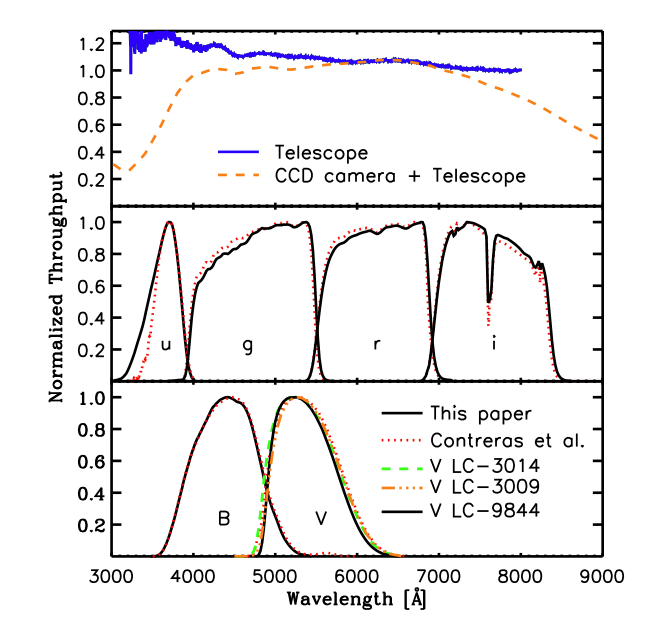 In the case of the optical filters, the current scans (from Stritgzinger et al. (2011)) are compared to the older filter curves from Contreras et al. (2010). In the case of the NIR filters, YJH are the filled colored curves and the old filter functions form Contreras et al. (2010) are drawn as dashed black lines. The following table lists the zero-points for the optical filters from Stritzinger et al. 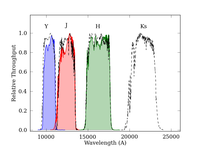 (2011) and the NIR filters from Contreras et al. (2010) . Click on the name to retrieve the filter response function, or get them all at once, including the individual optical components here. Note that there are 3 different V-band filters owing to the fact that the original (V LC-3014) was damaged on Jan. 14 2006. It was replaced with LC-3099 until Jan. 25 2006, when a closer match to the original (LC-9844) was installed and has been used ever since. The AB offsets are in the sense that m(AB) = m(natural) + offset. 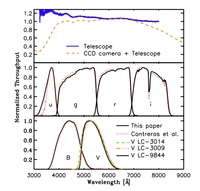 It is important to realize that the CSP BV and YJHK photometry are based on the standards of Landolt (2007) while the ugri photometry is based on the standards of Smith et al. (2002). In both cases, the standard magnitudes tabulated in those references are converted to our natural system magnitudes using the color terms published in Contreras et al. (2010). These natural system magnitudes are available here.